Years ago I read an excerpt from a book where the author extolled the wisdom of a woodsman that he had met. He cited an incident where the woodsman walked over to a certain plant and removed a bug from it’s stem that he in turn used as bait with which to catch fish. 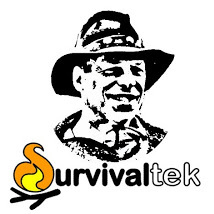 This was a facet of bushcraft that I wanted to learn more about. In more recent years I would walk through the woodland fields and notice the previous seasons’ long stemmed plants with marble sized galls in the middle and would open them to find nothing but a hole. 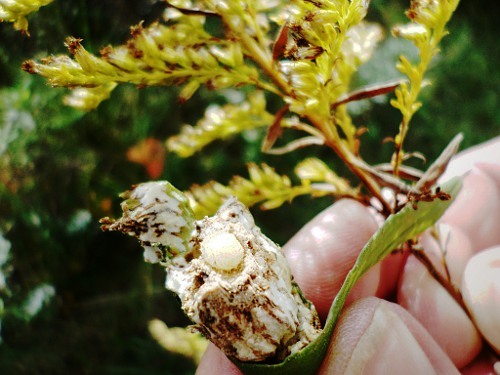 But after a little research I discovered that those long stemmed plants were goldenrod that are known to host grubs in those galls and with more persistent searches I began to find tiny grubs that had not hatched out or been eaten by birds or parasitic wasps. My findings began last fall where the grubs were about as small as a period at the end of a sentence. I waited through Winter and now in Spring those small grubs have grown larger. I understand that in the Northern states these grubs can be larger in size and are sought after for ice fishing. There they can be collected in the fall and stored in a refrigerator until Winter. They are effective for catching pan fish like blue gills and crappies. Recently I spoke with a friend who grew up in Wisconsin and as a young girl she would collect the goldenrod galls for her father who in turn would use them to catch the minnows with which he caught larger fish. I can envision that approach with the grubs that I have found. In any event, it’s good to be aware of this resource when you’re out in the field and have the need or desire to go fishing. This entry was tagged Bait, Fishing, Goldenrod, Grubs, Pan Fish. Bookmark the permalink.